Sometimes was the first UK Top 40 hit song of the eighties for Erasure. Released in October 1986, the single peaked at #2 in the UK and spent 17 weeks in the charts. The track featured on the album The Circus which was released several months later in March 1987. Erasure had three more hits from the album; It Doesn't Have To Be (#12), Victim Of Love (#7) and the title track The Circus (#6). 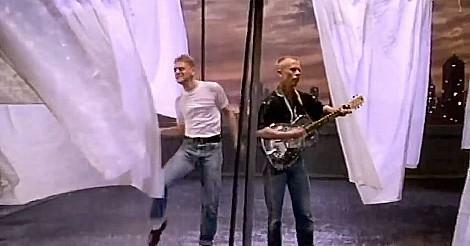 In the video, we see Andy Bell and Vince Clarke dancing around on top of a skyscraper/tower block in between several white sheets hanging out to dry. Andy is performing his awkward-looking dance moves, while Vince strums on his guitar. At one point, Andy walks along the edge of the roof and appears to jump off at around 1:43. Thankfully, it's not for real and he manages to finish the video! The B-side of the 7 inch vinyl single featured the track "Sexuality". The 12" version of "Sexuality" was included on the 12 inch single, as well as an extra track "Say What" (Remix). A limited edition 3 track 12 inch was released with "Sometimes" (Shiver Mix), "Sexuality" (Private Mix) and "Senseless" (Remix). A 5 track cassette single and 5 track CD single were also released with different track listings. 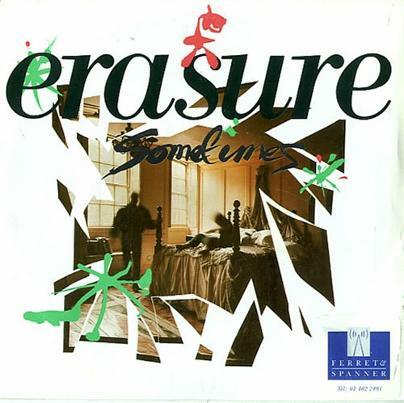 This 2015 re-issue of "Sometimes" features eight remixes of the song, and was released to promote the album "Always - The Very Best of Erasure".